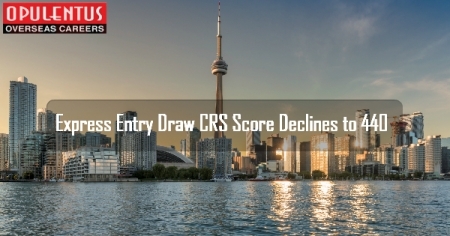 Immigration authorities in Canada have conducted another Express Entry draw, where the minimum CRS score declined to 440. This was equal to the lowest score for the present year. 3,750 candidates received the Invitations to Apply. This minimum CRS follows scores of 442, 441 in the previous weeks. This was the 96th overall and the 16th round of 2018. IRCC presently can set a specific number of invitations. When the number of candidates having the lowest score exceeds the number of invitations allowed, authorities give preference to such profiles which are in the Express Entry pool for a long time. The lowest score cut-off is based on the date and time of submitting the Express Entry profile. Moreover, after using a new format, immigration officials, have a greater control in implementing a modified method, for selecting the exact number of candidates, who can get the ITA. In the previous method this was not possible. In the recent draw d the trend of a CRS score below 500 continues. Experts expect that there will be around 30 draws where around 70,000 invitations will be issued in the present year. Several draws feature a CRS score that is below 450 and this will help immigration authorities in Canada to meet the target of annual immigration levels. Employers must also consider getting the LMIA or a nomination in provincial nomination programs. With these developments the aspirants can finally realize the fulfillment of their immigration dream.